Website backup is a matter of major importance for users and companies owning websites. 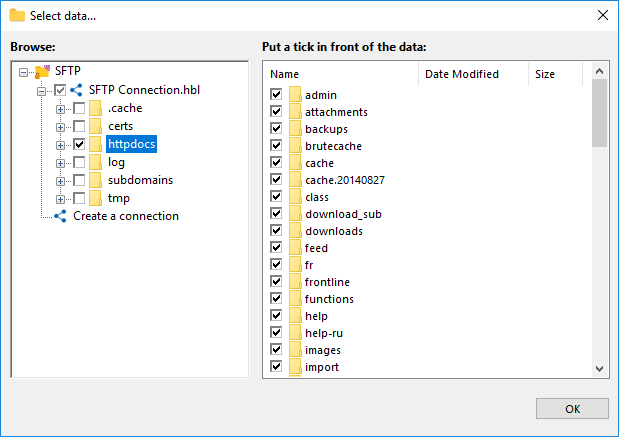 Handy Backup allows backing up static website pages via FTP, as well as using SQL database backup for saving dynamic content. Websites commonly depend on files (scripts, images, HTML, etc.) and databases (MySQL, MS SQL or other). Our website backup service lets you protect the both data types; therefore, in case of a disaster, web server downtime will be reduced to the minimum. Our backup software can access FTP data in both directions: to back up files from an FTP server, and to store backups to FTP. Along with database backup, this is a commonly perfect solution for any types of website backup. If you have a large website with thousands of pages, SQL-based database engines will keep some data (called a dynamic content) or even all website information for you. For web site backup, our backup utility can copy MS SQL, MySQL and other databases backup without stopping usual jobs. Unlike some website backup software, Handy Backup does not rely of saving browsed website content. Instead, it uses a direct access to web server files, so you can make a complete online website backup without exceptions, and always bring it back to work in case of a disaster. 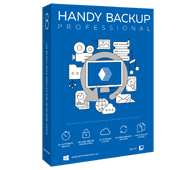 To back up website files and databases, you need a copy of Handy Backup Professional edition or higher. Free 30-days trial version! 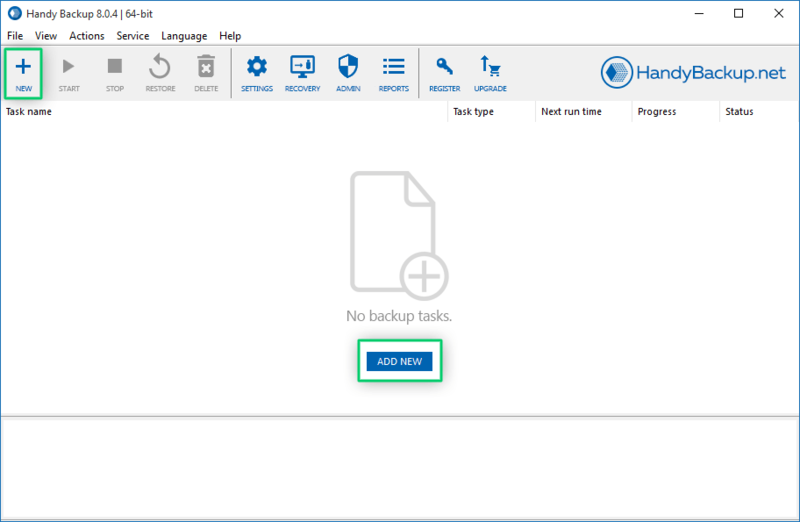 Handy Backup allows saving a content from any CMS or a standalone blog engine, like Magento or Wordpress backup, without using manual actions, scripts or dashboard functions such as backing up via cpanel. You can just connect to a CMS host like GoDaddy and save all static content via FTP/SFTP/FTPS and dynamic data via a DBMS. 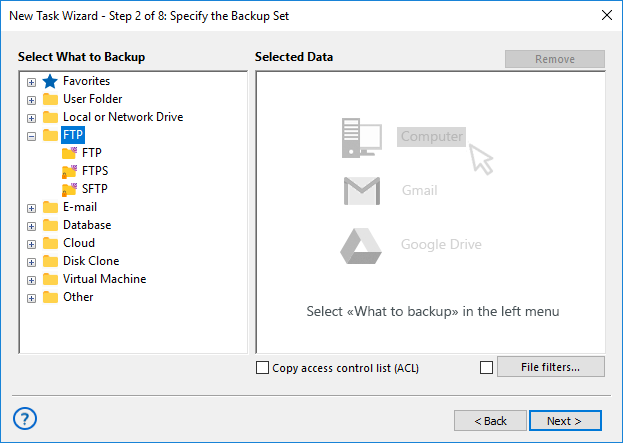 Handy Backup is a powerful tool allowing auto website backup to Google Drive, Dropbox or other cloud service, a local drive, a plugged USB storage device or any other data vault. It has a full support for such things as incremental website backup to save much space on a storage, regardless of a CMS used by hosting provider. Let us show how to back up a typical website using Handy Backup. In this example, we are assuming the website uses an SFTP protocol for static content and a MySQL database for dynamic content. Open the program. Create a new task by clicking on a main panel, or by selecting the "New task…", or just by pressing Ctrl+N. Select a backup task type. Go to Step 2 and find the SFTP feature on the left panel. Double-click on it, or click the "Add>>" button to open the SFTP plug-in dialog. Select an item called "New configuration" by double-clicking on it; a new dialog will appear. Enter all the parameters you need to access to your website via SFTP. After finishing, click OK.
Now check/uncheck the website data you want to back up from this website. Again, click OK. 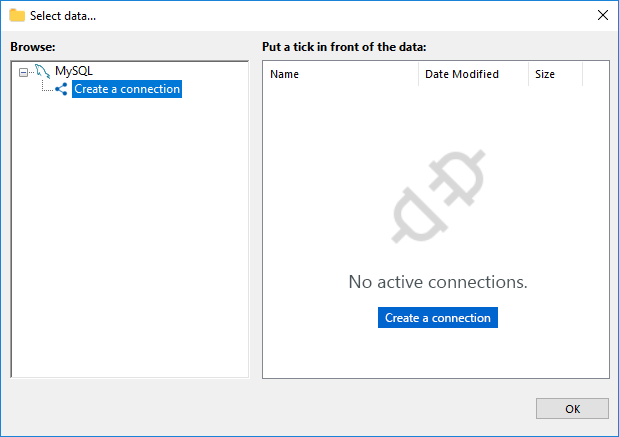 Note: For using other types of FTP connections, this software contains dedicated "FTP" and "FTPS" plug-ins. 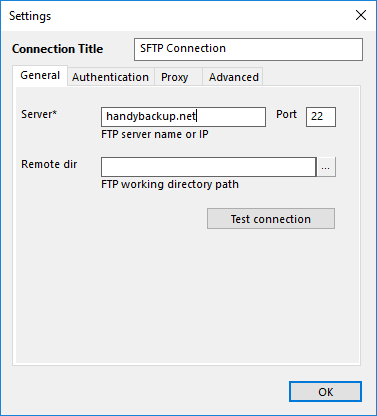 The basic principles for using these connections to website are quite same as for an "SFTP" feature. Now it is a time for dynamic content. 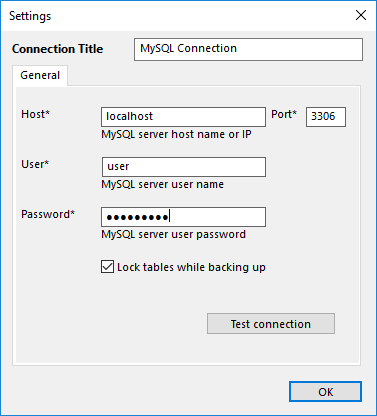 Return to the Step 2 main window and select "MySQL" among the "Databases" plug-in group by just the same way as selecting SFTP before. Click twice onto the "New configuration" string, and open the MySQL configuration dialog. Enter the connection parameters for accessing your website content via MySQL. 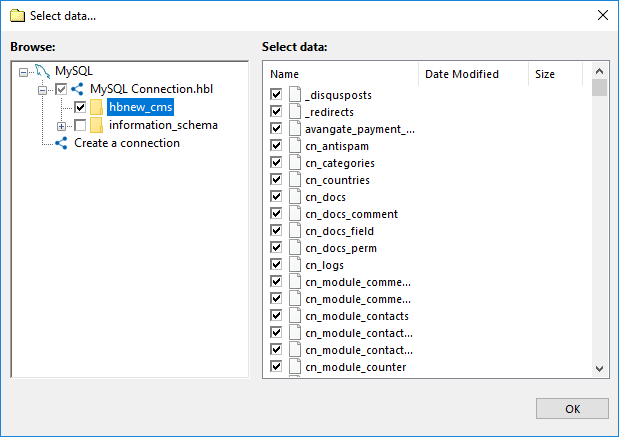 Click OK and return to the MySQL data dialog. Here, check the database you want to save. Click OK to continue. When returning to the Step 2, proceed to the next step. Now you can set up other task parameters such as a vault for your backups, compression and encryption, scheduling task jobs and other. These actions are not specific for backing up websites by any mean. Please read the User Manual for detailed instructions about these steps! Backing up your website allows minimizing the risk of data loss in case of a disaster and reducing downtime of your server to the minimum. Time is money - the less your site is unavailable, the less expenditures it causes. For most important projects, it is wise to not only have a backup and recovery plan, but also have a complete backup Windows server 2016. 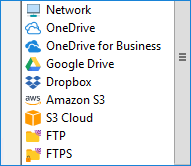 With Handy Backup, you can easily keep several files and databases in sync, so you can always use an alternative server if the original one fails. You can also clone a server by restoring website backup to a different computer (of course, the destination web server must have a similar configuration). In the next video, you will learn how to backup website quickly and easily with Handy Backup. This video will demonstarate a full cycle of website backup service operations, including copying and restoring statyc and dynamic content. Note: This video suggest that you already have a copy of Handy Backup installed on your computer. If you still have not done so, please download and install it — a 30-day free trial available! From now on, website backup is as easy as a 1-2-3! Yes, Handy Backup provides backup of the data base programs. It seems I should try the website backup, many oops happened recently.)) Why did not I do this earlier? Website backup with Handy Backup brings with a lot of benefits and advantages. Continuity of your business: in case of a disaster, your website will be up and running in less than an hour as you will be able to quickly restore the data to a new server. Reliable backup of any website data: the utility creates reserve copies of the entire site including all content, graphics and other data, or perform a selective backup. File-mask backup filtering allows you to back up data of selected type only: e.g. all HTML files, all PNG pictures, etc. Automated backup on a schedule: to securely protect your website data, it is enough to assign a backup schedule once and the program will take care of the rest.